We are still travelling around New Zealand and in the last few days we stayed in a lovely seaside town called Napier. Unfortunately the weather while we were there was really dreadful. The sea, normally a brilliant blue, was brown and muddy looking. It had a wild and primal look which totally suited the photos we saw in the wonderful museum and library which told the story of the town’s destruction and subsequent rebuilding in the early 1930s. The town of Napier was almost totally destroyed in an earthquake and the people who survived the event were left with only the clothes they were wearing. The earthquake was followed by a tsunami which only added to the death toll as many people had gone to the beachfront thinking that they would be safe there. In the aftermath, a decision was taken to completely rebuild the town in the Art Deco style which was popular at the time. As a result there are many beautiful buildings and the Art Deco theme is repeated everywhere, including the street signs. 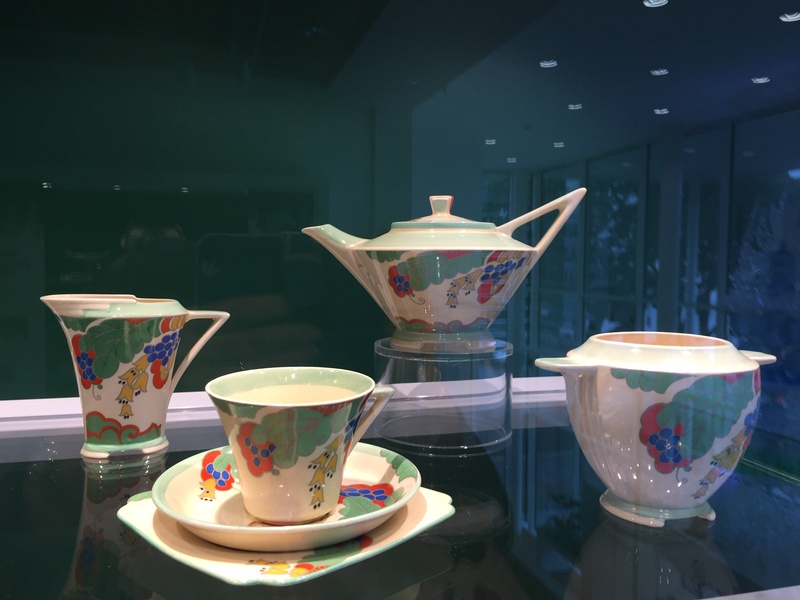 In the museum we also enjoyed a lovely exhibition of teapots and cups, many of which reinforced the Art Deco theme. I am currently in New Zealand doing a fantastic road trip with my husband. Today we stopped by the most amazing toilet block in the world. It was designed by a famous Austrian artist, Frederick Hundertwasser who lived in NZ for some years. Little did he know that his toilet block would attract thousands of international visitors and put the tiny town of Kawakawa on the map. The intricate design is very colourful and different. It’s surely the most popular public convenience in New Zealand, if not the world. b) the pieces I do like are very expensive (which is very unfortunate). In my travels around the internet I found a couple of beautifully designed chairs which appeal to me for reasons that I can’t easily articulate. There’s something about them that is very attractive. I think it might be the fluid lines. I particularly like this funky chair (known as the 45) which was designed by Finn Juhl, a Danish architect and interior and industrial designer. Finn Juhl was a pioneer in Danish design. In 1945 he designed this fantastic armchair which was one of the first to break with tradition by freeing the seat and back from the frame. The result was an elegant chair that came to characterise Finn Juhl and make him world famous as an unrivalled designer. See more of his designs here. 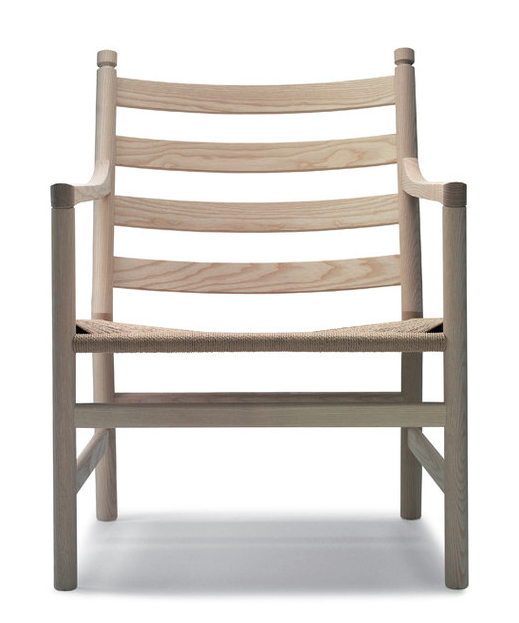 Another one that caught my eye is this ladderback chair, designed by another famous Dane, Hans Wegner. 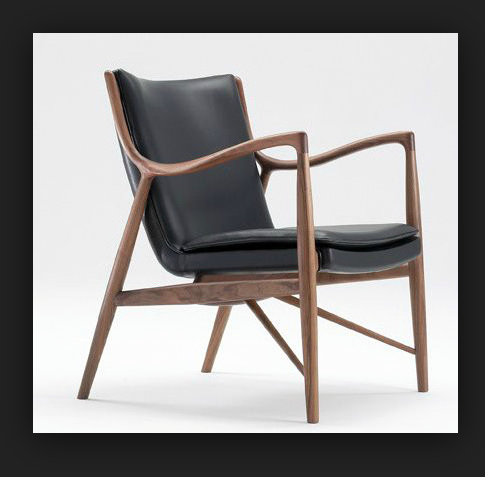 According to Wikipedia, Wegner (April 2, 1914 – January 26, 2007), was a world renowned Danish furniture designer. His style is is often described as Organic Functionality and in his lifetime he designed over 500 chairs, 100 of which were put into mass production and have become recognisable icons. I’d quite like one (or two) on my verandah or maybe in my study if I ever finish tidying it up! 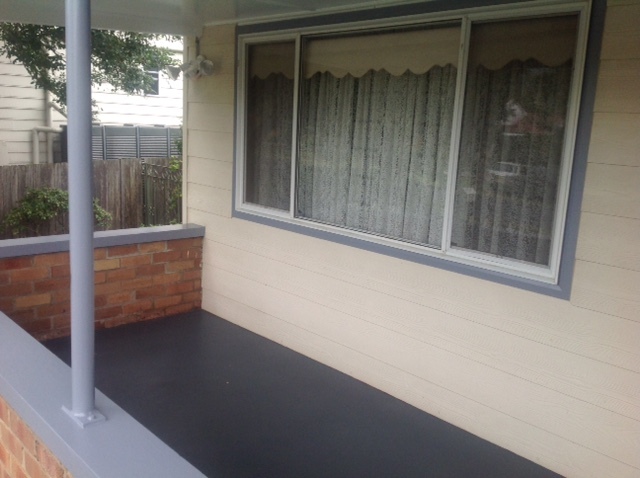 What do you think would look nice on our verandah? Any suggestions? Like many women of my age, my hair is rapidly becoming greyer by the day. I was looking at some old photos recently and my husband commented on the fact that over the past eight years we had gone from having brown hair (or black in his case), to having significant amounts of grey hair. The idea of having to ‘touch up my roots’ every few weeks is a boring and tedious task. Once you go beyond a little bit of grey at your temples, you really need to keep on top of the grey roots. One of my friends calls this ‘controlling the skunk’ because she has a tendency to develop a stripe down the centre of her head where her hair is parted. Whilst I am only too well aware that my grey hair makes me look quite a lot older than my colleagues of the same age, I am reminded of a dear friend who once told me that in her country of origin (Thailand), grey hairs are regarded as a symbol of wisdom and the more grey hairs you have, the more you are revered. I don’t need to be revered, but it was a good reminder that being older (and maybe wiser) is not necessarily a bad thing. Another reason that I haven’t dyed my hair is because I think it encourages other women to embrace who they are and not be afraid of showing their true selves to the world. I realise that this sounds a bit pompous. I don’t think of myself as some kind of feminist role model, but I do often have women say to me that they wish that they were brave enough to just be who they are, grey hair and all. The unfortunate part of going grey is that the lack of hair colour really drains you and can make you look rather drab. I was reminded of this in a recent article about choosing colours to decorate your home. The writer was quick to point out that a lack of colour can make a room seem lifeless, and this is the same for women. Interestingly enough, this does not seem to apply to men who are usually described as distinguished if they go a little bit grey at the temples. If you you’ve been dying your hair for a long time, it’s quite hard let your it revert to its natural colour, be that brown, grey, or a salt and pepper mixture of the two. It takes at least six months to grow out the colour, during which time you can look pretty dreadful. If you are thinking about letting your hair go grey, it’s worthwhile thinking about other ways you can add colour to your life. A touch of lipstick, a colourful scarf and some bright earrings can add a bit of zing and be very effective. Grey and silver are incredibly sophisticated, but they require the careful use of colours and textures to make them work. Here are some design tips that work equally well for women and for graphic design work. Keep it simple – eliminate items that don’t contribute to the overall effect. A simple approach to design always looks sophisticated. Think about textures and shapes. An absence of colour helps you concentrate on other aspects of design. For women, this means having a really good haircut. For graphic design, this means using a range of textures and shapes to create interest. Use colour to highlight the most important things. In the examples below you can see that colour has been used wisely and to great effect. There’s nothing boring or lifeless about these websites. I’m not here to persuade you to let your hair go grey, it’s a personal thing and none of my business, but I would encourage you to consider the elegant simplicity of grey. It can be classy and beautiful. To grey or not to grey? THAT is the question! Clear and appropriate typography (you need to be able to read it easily and the font needs to match the message). A clear message (this is the hardest element as it requires you to actually think about what your key message is). There are lots of other things that contribute to good design, including colour, but I think these are the most important. This one is fairly self-evident and doesn’t require a lot of explanation, but it really surprises me how often people choose totally inappropriate fonts for their documents. Typefaces have their own personality and should be chosen with care. If you are looking for something whimsical or handwritten by all means use Bradley handwritten, but don’t even think about using this for a board report. Even a very long email or report can be made more consumable by using white space to break up your text. Use spaces and headers to avoid large clumps of text and people will be more likely to read to the end. I recommend using this technique in emails as well as other documents. Using white space makes people feel less overwhelmed and more able to read the important parts of your message. This is the hard one. Sometimes we aren’t at all sure about what our key message is, and as a result it can get lost in a forest of words. We can beat around the bush and confuse people by not stating the obvious. I strongly recommend writing your key message out in a nice concise sentence and actually including it in your document somewhere, preferably near the beginning. If you are starting from scratch with a document or even a simple email message, you should put your key idea at the top. If you want someone to respond to your email, why not tell them at the beginning that you expect a response, instead of at the end? I know these ideas don’t sound very hard or radical, but you would be surprised how much difference using these simple principles will make to the information products you create.